Today is the Feast of one of my oldest friends in Heaven, St. Anthony, the wonderworker of Padua. Although perhaps best known and invoked for his help in finding lost articles, it is worth recalling that one of the greatest miracles attributed to this Saint involves the delivery of his 'brief' to a woman on the verge of suicide, which enabled her to recover herself and turn away from this ultimate act of self-harm. The brief is a short prayer, or rather statement, invoking Our Lord as the 'Lion of the the Tribe of Juda' and commanding the flight of evil powers. It is traditionally either printed on linen and worn under clothing, or incorporated into a medal in the form of a cross. ﻿As a teacher who works with youngsters who are experiencing mental health issues, I frequently encounter people with suicidal thoughts. This can be a particular issue around this time of the year when the stress of exams can take its toll. I therefore ask St. Anthony's prayers for all who, at this time, are being troubled by hopelessness and thoughts of ending their lives, and would ask my readers, of your Charity, to do the same. 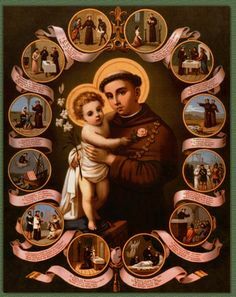 Wonderful Prayer of Saint Anthony of Padua, Matthaeus. Be assured of constant Prayers for your Students.